March is always an odd month. You never know what the weather is going to be and deep down you are anticipating the nice weather and sunshine coming but still getting hit with random cold weather and snowstorms... or at least that has been my experience here in the Northwest. I feel the same odd tension with food choices- I still crave the warm comfort foods from winter but also want to turn on the grill and start exploring salads and warm weather foods. This month's recipe contains a bit of both winter comfort and fresh warm weather vegetables. The comfort comes from the bacon- YUM! And the vegetables highlighted this month are peas, asparagus, and sugar snap peas. I have decided this salad will be my new go to for potlucks and parties because it is definitely a crowd pleaser. Asparagus: is full of various phytonutrients and antioxidants. One to mention is called asparagusic acid which causes the asparagus smell to show up in your urine. Everyone metabolizes this in various ways, so not everyone can smell the resulting chemical in their urine. The breakdown of this chemical also plays a roll as a cofactor in aerobic metabolism. Plus its delicious! Peas: peas are a part of the legume family. Research has shown that peas contain all sorts of antioxidants. One in particular is called coumestrol- which has shown to benefit our stomach health and specifically reduce the risk of stomach cancer. Peas also have a high amount of protein for a vegetable (8-10g per cup). They are full of fiber and actually contain omega-3 fatty acids as well! All of these attributes make peas a strong fighter against inflammation and other chronic diseases. Sugar Snap Peas: are unique in the fact that they provide a significant amount of iron for a vegetable. Iron is better absorbed with Vitamin C, which sugar snap peas also contain a significant amount of. This means you'll get more bang for your buck in iron absorption when choosing sugar snap peas! In a large saucepan, bring water to a boil. 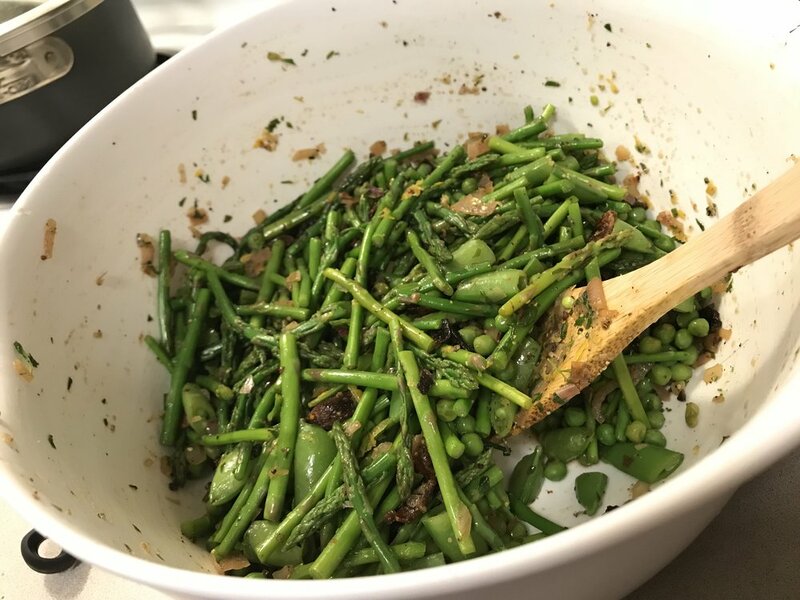 Chop sugar snap peas and asparagus. Once water is boiling, place vegetables in water fro 3 minutes. Drain and rinse under cold water and set aside. Meanwhile, cook the bacon in a saute pan. Once cooked, set aside. Pour off all but 1 TBSP of the bacon grease. Add shallots to the saute pan and cook until they begin to brown. Add vinegar, mustard, and tarragon. Quickly mix and then add vegetables to pan. Mix until coated. Then place in a bowl. Mix in salt, pepper and lemon zest. Break up the bacon into bits and mix in. Enjoy!! We served ours with grilled steak seasoned with Spiceology's Cowboy Crust Seasoning and farro.